Like it or not, trees are a central feature of development sites today, following the guidance and recommendations of the British Standard 5837 there is considerable emphasis on their protection. Tree root protection areas (RPAs) can extend as far as 15m from the trees trunk and in some cases further, where the rooting environment of the tree is considered to be asymmetric. However, the British Standard 5837 ‘Trees in Relation to Construction, Recommendations’ 2005 (BS 5837:2005) offers developers considerable opportunities to build within the RPAs of retained trees, by following the advice of an arboriculturist. The BS 5837:2005 emphasises that “the part of the tree most susceptible to damage is the root system, which, because it is not immediately visible, is frequently ignored” and that “damage to, or death of the root system affects the health, growth, life expectancy and safety of the entire tree.” This is why the emphasis on tree protection considers such a large area around the base of the tree, in an effort to retain as many roots as possible. However, when the tree survey has been completed and the designated RPAs have been plotted onto the topographical survey, it can appear that there is very little space left to be developed, and that the presence of trees has precluded effective and economic use of the site. This is not the case and the following case study has been produced by ArborEcology to illustrate the opportunities that are available for construction work within the RPAs of retained trees. The site used as a basis for this case study is the garden of a detached house with a mixture of hard and soft landscaping surrounding the residential dwelling. The hard landscaping is predominately crazy paving with areas of tarmac. The site includes a number of trees, which are covered by tree preservation orders (TPOs), with the RPAs extending up to and in some cases overlap the proposed development foot print. Tree roots found under the impermeable concrete, illustrated in this photograph, were clearly growing towards the area of garden that offered better rooting conditions. However, this area of garden was outside the RPA yet the roots found here could be consider as the most significant to tree health and survival.The client applied for planning permission to extend the house to the east with a single story extension, 12 metres from the gable end. This was rejected by the Local Planning Authority (LPA) on the grounds that the footprint extended into the designated RPA of several trees suitable for retention. The brief was to explore the proposed development footprint to see what roots were actually present and to assess the likely impact of the extension. Assuming the presence of roots, exploratory trenches were excavated to determine practicality of extension within the RPA, whilst ensuring the continued health of the retained trees. The picture shows the AirPick and Soil Vacuum in action, with the soil being collected in a container to enable trenches to be filled back in following inspection.The proposed footings, along with another trench 5 metres from the gable end, were marked out by the architects and the concrete and crazy paving broken up. 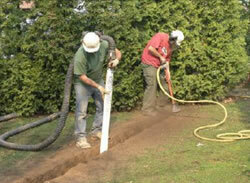 A 600mm deep trench was then excavated. 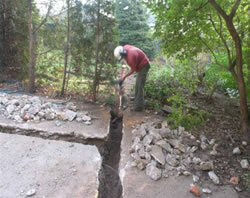 The soil was broken up with an AirPick and removed using a soil vacuum unit. This method made it possible to retain even the smallest roots. The location and origin of root were then noted by using the proposed footings as a line transect. A site meeting was then held with the tree officer, architects and client to discuss the result. It appeared that the tree roots were merely ‘bridging’ the area of hard surfacing in search of the more favourable rooting conditions outside of the designated RPA. This information allowed the area utilised by the trees to be sufficiently protected whilst allowing a compromise to be met with consideration to the size and position of the extension. An agreement could be reached where the development is allowed within the RPA, on the basis that the area of consideration given to tree roots is extended to include the places where the tree is clearly gaining most benefit. 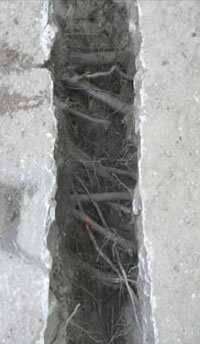 The picture illustrates the extent of root growth under the impermeable concrete surface. This collection of Lime roots were traced across the hard standing area, in search of favourable rooting condition in the lawn.The information gained from the site investigations could be presented to the LPA to help inform the planning application and the preparation of an Arboricultural Method Statement (AMS), which is written to support the proposed layout design with consideration to its construction in close proximity to trees. When planning permission is granted for the development, the location of the roots can be passed onto the engineers so they can be considered and appropriately avoided during foundation design. Informing the design and planning process in this way, with meaningful exploration work to find out where roots actually are can enable very successful and sympathetic juxtaposition of new buildings and retained trees. d) preserve the soil structure at a suitable bulk density for root growth and function (in particular for soil of a high fines content). Trees that have good health and stability are well adapted to their surroundings. Any development activity which affects the adaptation of trees to a site could be detrimental to their health, future growth and safety. Read more about how the AirKnife works an idea of where it can be used: construction sites, pipeline trenching, tree health investigations, remedial mulching and our tree root research.